Home » Finance news » Can Russia’s rouble swim against the falling tide of EM currencies? Can Russia’s rouble swim against the falling tide of EM currencies? Over the last three months, the Russian rouble has outperformed many emerging market currencies, buoyed by rising oil prices and an accommodative central bank, but it continues to suffer under the pressure of potential fresh US sanctions against Russia. A fresh round of sanctions could block US imports of Russian oil and ban international bank loans to the country, and could come in as early as next month, according to reports. Earlier this year, the US initiated a first round of sanctions that stopped the sale of arms and exports of national security-sensitive goods and technology to Russia. A key driver for this outperformance has been rising oil prices; Brent crude is up some 14% this year, to trade at $76 a barrel as of October 24. The price is expected to go higher. In their latest monthly forecast, JPMorgan’s commodities analysts have increased their Brent price target for the fourth quarter 2018 to $90 a barrel, leading to a 5% increase in their forecasts for the rouble over the next three quarters. 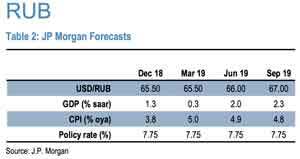 At current levels, JPMorgan sees the rouble as undervalued, meaning the currency could strengthen in the coming quarters. The analysts upgraded their six-month targets by 3% on the back of near-term stress alleviation and fundamental drivers: they expect the rouble to be trading at 65.50 against the dollar by the first quarter of 2019, up from a previous target of 69. According to the bank’s global FX strategy and EM markets team: “Valuations remain supportive against a favourable oil backdrop. In our preferred methodology to take into account the budget rule, our Beer FV model relies on a weighted average between the current oil price (1/3 weight) and the budget oil price (2/3 weight; Brent at $42.8 a barrel). Such an adjustment to the model leaves RUB currently 8.3% cheap to fair value. NOTE: if you do not have time to search for strategies and study all the tools of the trade, you do not have the extra funds for testing and errors, tired of taking risks and incurring losses – trade with the help of our Keltner channel forex robot developed by our professionals. 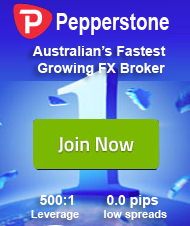 Also you can testing in Metatrader our forex auto scalper robot free download . According to Kit Juckes, macro strategist at Société Générale, there are a number of positive drivers that could help the rouble continue “against the prevailing tide”. A key area to watch is the action of the central bank over the coming months. In September, the central bank raised its main interest rate by 0.25% to 7.50%, but it is unclear if another hike is imminent. Ed Al-Hussainy, senior rates and currency analyst at Columbia Threadneedle Investments, says: “This would help support the rouble by giving investors additional compensation for the geopolitical risks surrounding sanctions. For traders: We recommend you odin forex robot free download for test in mt4 or our best Portfolio of forex robots. However, valuations in Russia are highly dependent on geopolitics, and volatile relations between the US and Russia are putting continued pressure on Russian assets. With the threat of new US sanctions on the horizon, the direction of currency movement is hard to predict. Some investors consider the uncertain geopolitical situation to be simply short-term noise that creates investment opportunities. The Nikko AM EM Local Currency Bond fund had an allocation to the Russian rouble of approximately 6% as of September 28. However, others are not as sanguine on the prospects for the rouble, fearing that bad news headlines could easily send it into freefall. Paul McNamara, investment director at GAM Investments, says: “Russia is cheap. With the oil price up you can argue it is really cheap, but the threat of sanctions is a problem. The nuclear option is if the US goes after the ability to own Russian government debt, which will also have a knock-on effect on anyone who does business in the States. This would send the rouble significantly lower from here. SocGen’s Juckes agrees that the threat of sanctions is making the rouble look less attractive. He adds that it must also be viewed against the backdrop of the general downward trend of EM currencies. “The tide is going out from most EM currencies as global monetary policy gets tightened and liquidity gets taken out of the system in general,” he says, “so it is hard to get bold about [the rouble].